جلالی, ام البنین, نصراللهی, زهرا, هاتفی مجومرد, مجید. (1397). همبستگی بین دین‌داری با عملکرد تیمی و تصمیمات فردی در چارچوب بازی‌های رفتاری دو نفره. اقتصاد اسلامی, 18(71), 139-165. ام البنین جلالی; زهرا نصراللهی; مجید هاتفی مجومرد. "همبستگی بین دین‌داری با عملکرد تیمی و تصمیمات فردی در چارچوب بازی‌های رفتاری دو نفره". اقتصاد اسلامی, 18, 71, 1397, 139-165. جلالی, ام البنین, نصراللهی, زهرا, هاتفی مجومرد, مجید. (1397). 'همبستگی بین دین‌داری با عملکرد تیمی و تصمیمات فردی در چارچوب بازی‌های رفتاری دو نفره', اقتصاد اسلامی, 18(71), pp. 139-165. جلالی, ام البنین, نصراللهی, زهرا, هاتفی مجومرد, مجید. همبستگی بین دین‌داری با عملکرد تیمی و تصمیمات فردی در چارچوب بازی‌های رفتاری دو نفره. اقتصاد اسلامی, 1397; 18(71): 139-165. یکی از مسائلی که در محیط‌های کار تیمی رخ می‌دهد، اثرگذاری تصمیمات هم‌گروه یا هم‌تیمی بر تصمیم هم‌گروه‌های دیگر است. حال این اثرگذاری وقتی به معضل تبدیل می‌شود که یکی از اعضای گروه در قبال دریافت پاداش بیشتر، کار کمتری ارائه کند. در این شرایط اگر سایر اعضای گروه از این تصمیم تبعیت کرده و آنها نیز طفره‌روی را انتخاب کنند، در نهایت برآیند یا عملکرد تیمی افول خواهد کرد. در این راستا مطالعه حاضر بر آن شد با استفاده از محیط آزمایشگاهی و انجام بازی‌های دو نفره که کامل، ایستا و پویا، تمام و ناتمام به بررسی همبستگی دین‌داری با عملکرد تیمی و تصمیمات فردی بپردازد. نتایج به‌دست‌آمده از 182 نمونه و 2184 مشاهده نشان داد که درصد مشارکت تیمی که هر دو بازیکن تلاش کنند در طیف دین‌داری بالا بیشتر از طیف‌های دین‌داری متوسط و کم است. در مقابل نتایج نشان داد که تولید تیمی بازیکنان با سطح دین‌داری کم، بیشتر از تولید تیمی بازیکنان با سطح دین‌داری بالا و متوسط است. نتایج به­‌دست‌آمده از همبستگی دین‌داری با تصمیم افراد نیز نشان داد که افراد با سطح دین‌داری بالا در هنگام پاداش زیاد، از تصمیم هم‌گروه خود اثرپذیری خاصی نداشته و به‌طور مستقل تصمیم گرفته‌اند؛ اما در دین‌داری متوسط، این استقلال فقط در بازی همزمان در هر دو سطح پاداش پایین و بالا مشاهده شد. One of the issues that occurs in teamwork environments is the impact of cohort or team decisions on the decision of other cohorts. Nowadays, this effect becomes a dilemma when one of the members of the group offers less effort against more reward. In this situation, if other members of the group follow this behavior by this decision and they dodge, they will eventually end up or the team's performance will decline. In this regard, the present study aimed to investigate the correlation of religiosity with team performance and individual decisions using a laboratory environment and performing two-player complete, static and dynamic games; complete and incomplete. The results from 182 samples and 2184 observation showed that the percentage of team participation that both players endeavor to perform in the high religiosity range is more than moderate and low in the range of religiosity. In contrast, the results showed that team production of players with a lower level of religiosity was more than the production of a team of high and moderate level players. The results of religiosity correlation with people's decision also showed that individuals with high religiousness at high rewards did not have a specific impact on their cohort's decision and decided independently. However, in moderate, this independence was observed only in the simultaneous game at both lower and upper reward levels. انصاری سامانی، حبیب و همکاران؛ «اثر دین‌داری بر تعاون ارزیابی رفتار دانشجویان در بازی کالای عمومی»، دوفصلنامه سیاست‌گذاری اقتصادی؛ ش16، 1395. پورفرج، علیرضا و همکاران؛ «روش‌شناسی اقتصاد آزمایشگاهی برای مطالعه انسان اقتصادی اسلام، دین‌داری و رفتار اقتصادی»، دوفصلنامه مطالعات اقتصاد اسلامی؛ ش2، 1394. پورفرج، علیرضا و همکاران؛ «دین و رفتار اجتماعی بررسی اثر دین‌داری بر رفتار مشارکت از طریق یک مطالعه آزمایشگاهی»، دوفصلنامه جستارهای اقتصادی؛ ش22، 1393. جلالی ام‌البنین و همکاران؛ «بررسی اثر پاداش بر تلاش فردی بازیکنان: رهیافت یک بازی رفتاری»، فصلنامه تحقیقات مدلسازی؛ ش32، 1397. جلالی ام‌البنین؛ «عوامل مؤثر بر چرخش انگیزه‌ها: رهیافت آزمایشگاهی مبتنی بر نظریه بازی‌ها»؛ رساله دکتری دانشگاه یزد، 1397. 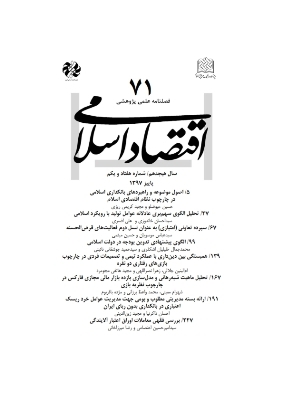 جلالی ام‌البنین و زهرا نصراللهی؛ «بررسی آزمایشگاهی اثر دینداری بر تقابل انگیزه‌های فردی: رهیافت بازی‌های متوالی با اطلاعات کامل»، فصلنامه اقتصاد اسلامی؛ ش69، 1397. روشندل ‌اربطانی، طاهر و حبیب ابراهیم‌پور؛ «بررسی نقش دین‌داری در کاهش رفتارهای غیرمدنی سازمانی کارکنان دانشگاه، مورد مطالعه دانشگاه محقق اردبیلی»، فرهنگ در دانشگاه اسلامی؛ ش1 (پیاپی18)، 1395. قاسمی، حمیده و دیگران؛ «پیش‌بینی دین‌داری دانشجویان دانشگاه شهید چمران اهواز بر اساس خودکارآمدی الگوبرداری معنوی، ادراک از دین‌داری والدین و ویژگی‌های شخصیتی»، فصلنامه دانش و پژوهش در روانشناسی کاربردی؛ ش4، 1395. مردانی‌ولندانی، مریم؛ «رابطه نوع­دوستی با دین‌داری و جهت‌گیری مذهبی»، فصلنامه اخلاق؛ ش17، 1394. Anderson, Lisa R. and Jennifer M. Mellor; “Religion and cooperation in a public goods experiment”, Economics Letters; no. 1, 2009. Bering, Jesse M. Katrina McLeod, and Todd K. Shackelford; “Reasoning about dead agents reveals possible adaptive trends”, Human Nature; no. 4, 2005. Binmore, Ken; Game theory: a very short introduction; Vol. 173. Oxford University Press, 2007. Brown, Sarah, and Karl Taylor; “Religion and education: evidence from the National Child Development Study”, Journal of Economic Behavior & Organization; no. 3, 2007. Bulbulia, Joseph, and Andrew Mahoney; “Religious solidarity: The hand grenade experiment”, Journal of Cognition and Culture; No.3, 2008. Bulbulia, Joseph, and Richard Sosis; “Signalling theory and the evolution of religious cooperation”, Religion; No.3, 2011. Cronk, Lee; “Evolutionary theories of morality and the manipulative use of signals”, Zygon; No.1, 1994. Eckel, Catherine C. and Philip J. Grossman; “Giving to secular causes by the religious and nonreligious: An experimental test of the responsiveness of giving to subsidies”, Nonprofit and Voluntary Sector Quarterly; No.2, 2004. El Ghoul, S, Guedhami, O, Ni, Y, Pittman, J, & Saadi, S.; “Does religion matter to equity pricing?”, Journal of Business Ethics; No.4, 2012. El-Menouar, Yasemin; “The five dimensions of Muslim religiosity. Results of an empirical study”, methods, data, analyses; No.1, 2014. Elnahas, Ahmed M, M. Kabir Hassan, and Ghada M. Ismail; “Religion and ratio analysis: Towards an Islamic corporate liquidity measure”, Emerging Markets Review; No.30, 2017. Glaeser, Edward L, and Bruce I. Sacerdote; “Education and religion”, Journal of Human Capital; No.2, 2008. Granger, Maury D, and Gregory N. Price; “The tree of science and original sin: Do christian religious beliefs constrain the supply of scientists?”, The Journal of Socio-Economics; No.1, 2007. Heineck, Guido; “Does religion influence the labor supply of married women in Germany?”, The Journal of Socio-Economics; No.3, 2004. Hilary, Gilles, and Kai Wai Hui; “Does religion matter in corporate decision making in America?”, Journal of financial economics; No.3, 2009. Iannaccone, Laurence R.; “Sacrifice and stigma: reducing free-riding in cults, communes, and other collectives”, Journal of political economy; No.2, 1992. Irons, William; Morality, religion, and human nature; New York: Religion and Science, Routledge, 1996b. Irons, William; Morality as an evolved adaptation; Investigating the Biological Foundations of Morality, Edwin Mellon Press, Lewiston, 1996a. Kaasa, Anneli; “Culture, religion and productivity: Evidence from European regions”, Business and Economic Horizons; No.1, 2016. Lipford, Jody W, and Robert D. Tollison; “Religious participation and income”, Journal of Economic Behavior & Organization; No.2, 2003. Marshall, A.; The Principles of Economics; New York: Prometheus Books, 1890. McCleary, Rachel M, and Robert J. Barro; “Religion and economy”, Journal of Economic Perspectives; No.2, 2006. Minton, Elizabeth A, Lynn R. Kahle, and Chung-Hyun Kim; “Religion and motives for sustainable behaviors: A cross-cultural comparison and contrast”, Journal of Business Research; No.9, 2015. Mookerjee, Rajen, and Krista Beron; “Gender, religion and happiness”, The Journal of Socio-Economics; No.5, 2005. Norenzayan, Ara, and Azim F. Shariff; “The origin and evolution of religious prosociality”, Science; No.5898, 2008. Orbell, John, Marion Goldman, Matthew Mulford, and Robyn Dawes; “Religion, context, and constraint toward strangers”, Rationality and Society; No.3, 1992. Osborne, Martin J, and Ariel Rubinstein; A course in game theory; MIT press, 1994. Pichon, Isabelle, Giulio Boccato, and Vassilis Saroglou; “Nonconscious influences of religion on prosociality: A priming study”, European Journal of Social Psychology; No.5, 2007. Randolph-Seng, Brandon, and Michael E. Nielsen; “Honesty: One effect of primed religious representations”, The International Journal for the Psychology of Religion; No.4, 2007. Ruffle, Bradley J, and Richard Sosis; “Cooperation and the in-group-out-group bias: A field test on Israeli kibbutz members and city residents”, Journal of Economic Behavior & Organization; No.2, 2006. Smith, A.; The Wealth of Nations; New York and Toronto: Random House, 1776. Soler, Montserrat; “Commitment costs and cooperation: Evidence from Candomblé, and Afro-Brazilian religion”, The evolution of religion: Studies, theories, and critiques; No.2, 2008. Sosis, Richard, and Eric R. Bressler; “Cooperation and commune longevity: A test of the costly signaling theory of religion”, Cross-cultural research; No.2, 2003. Sosis, Richard, and Bradley J. Ruffle; “Religious ritual and cooperation: Testing for a relationship on Israeli religious and secular kibbutzim”, Current Anthropology; No.5, 2003. Tan, Jonathan HW. ; “Religion and social preferences: An experimental study”, Economics Letters; No.1, 2006. Tan, Jonathan HW, and Claudia Vogel; “Religion and trust: An experimental study”, Journal of EconomicPsychology; No.6, 2008. Videras, Julio; “Religion and animal welfare: Evidence from voting data”, The Journal of Socio-Economics; No.4, 2006. Von Neumann, John, and Oskar Morgenstern; Theory of games and economic behavior (commemorative edition); Princeton university press, 2007. Weber, M.; The Protestant Ethic and the Spirit of Capitalism; London: Allen & Unwin, 1905. Klor, Esteban F, Sebastian Kube, and Eyal Winter; “Can higher rewards lead to less effort? Incentive reversal in teams”, Journal of Economic Behavior & Organization; No.97, 2014. Winter, Eyal; “Incentive reversal”, American Economic Journal Microeconomics; No.2, 2009. Sosis, Richard; “Costly signaling and torch fishing on Ifaluk Atoll”, Evolution and Human Behavior; No.4, 2000.